This naturally-processed coffee is a superb example of what some of the younger growers in Brazil's Cerrado Mineiro region are doing. This coffee is distinguished by chocolate flavors in the nose and the taste. The taste is characterized by red fruit flavors overlaid on semi-sweet chocolate; these flavors combined with a rich mouth-feel, long finish and medium acidity makes for a great coffee. This naturally-processed coffee is a superb example of what some of the younger growers in Brazil's Cerrado Mineiro region are doing. Of the Brazilian coffees we cupped this was a standout. This coffee is distinguished by chocolate flavors in the nose and the taste. The taste is characterized by red fruit flavors overlaid on semi-sweet chocolate; these flavors combined with a rich mouth-feel, long finish and medium acidity makes for a great coffee. Ricardo Domingues de Araujo is a passionate grower who seeks to continually improve his coffee, and such dedication earned him, in 2005, first place in a quality competion promoted by Cafe do Cerrado, the regional coffee association. Ricardo, descended from Spaniards, is following in his father's footsteps in the coffee business, bringing a passion for growing the finest coffee. The Fazenda, near Unaí in the northwest corner of the state of Minas Gerais, comprises 219 acres of which 76 are dedicated to coffee. Both Acaia and Red Catuai varietals are cultivated on the Fazenda São Sebastião. Our Brazil Cerrado is the Acaia varietal. The coffee is grown at 900 meters (almost 3,000 feet), and the beans are naturally processed. The Araujo's are diligent in preserving a portion of the Fazenda as natural reserve, with over 30% of the plantation's area left to nature. 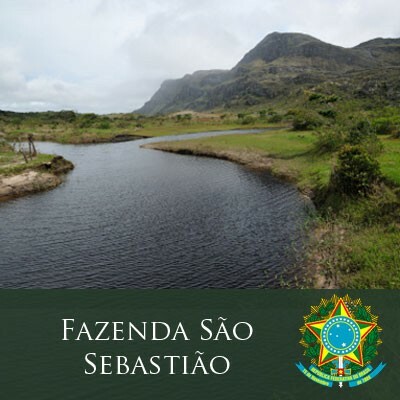 Brazil Cerrado "Fazenda São Sebastião"